Every dealership that takes care of their customers, makes everything possible to find out their thoughts about the dealership. You’ll want to periodically measure results of your work to see if you’re meeting your goals and objectives. You should know if you’re heading in the right direction and if your customers are really satisfied with your work. This will help you develop a successful marketing plan. 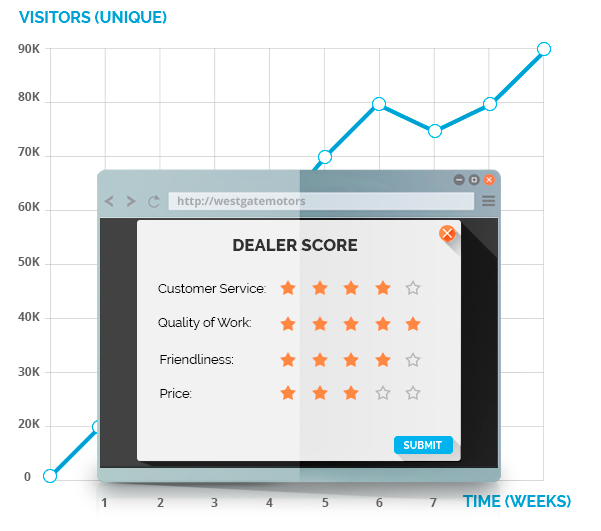 You can focus your efforts on the expectations your customers have of your dealership. So if you are interested in managing the research process, use Autoxloo’s Traffic Survey module. Traffic Survey provides customer’s feedback about your service. It’s a measurement of your customer’s satisfaction with you, your work, vehicles, employees and so on. And if it’s not to high then you may want to make a few slight tune ups to your approach. Improve customer satisfaction by knowing their needs and expectations. Customer satisfaction surveys aren’t just a series of questions you ask your customers to answer. How do you make the important decisions that affect your dealership? Don’t leave it up to random chance. Traffic Survey is an answer to this question. It also allows you to stay on top of what the competition is doing as well as what is going on in the industry. Let Traffic Survey help you get the information you need. stomer satisfaction surveys aren’t just a series of questions you ask your customers to answer. How do you make the important decisions that affect your dealership? Don’t leave it up to random chance. Traffic Survey is an answer to this question. It also allows you to stay on top of what the competition is doing as well as what is going on in the industry. Let Traffic Survey help you get the information you need. You can have as many surveys as you want at the same time hosted on your website. It is possible to change popup pages and custom pages on which your survey will appear. Traffic Survey lets you choose from a wide variety of professionally developed survey templates that make getting started fast and easy. Also you can design your own surveys. The intuitive web interface enables you to create quality surveys in minutes. No technical experience is necessary. Do-It-Yourself (DIY) survey software market. You can offer surveys at once when the customers visit your website or configure the software in such way that survey window appears only through a certain period of time. So, you can be sure, that your website will not be annoying. Choose multiple or single choices for the answers. Moreover, you can set up Traffic Survey in such a way that choosing some specific type of answer, the customer will be redirected to a certain page. Enjoy the advantage of real-time data. Check out our automatically build chart and rating of answers. Autoxloo minimizes the cost of technology while dealers benefit from quality tools designed specifically for the automotive industry. Traffic Survey gives you the power to create, manage and analyze surveys and do it easily and nearly instantly. Build your success!